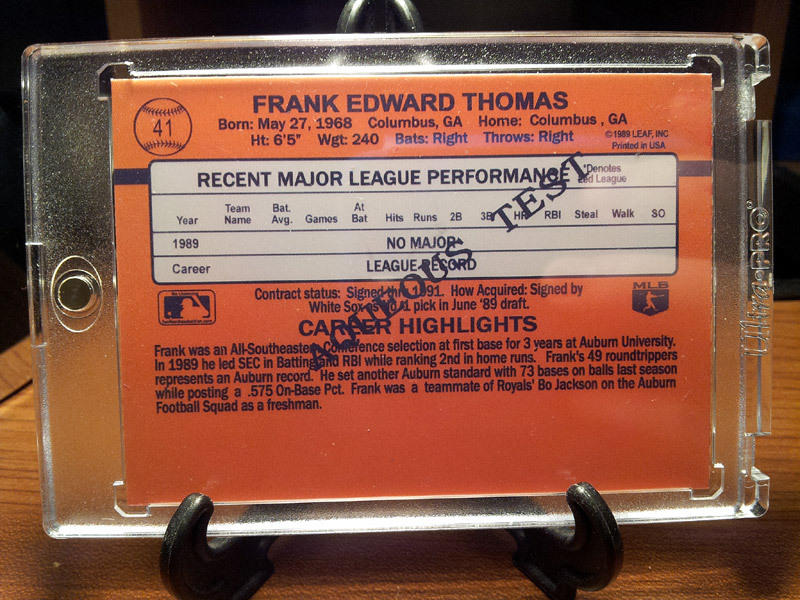 Frank Thomas Rated Rookie? Former Donruss Employee Confirms Existence. 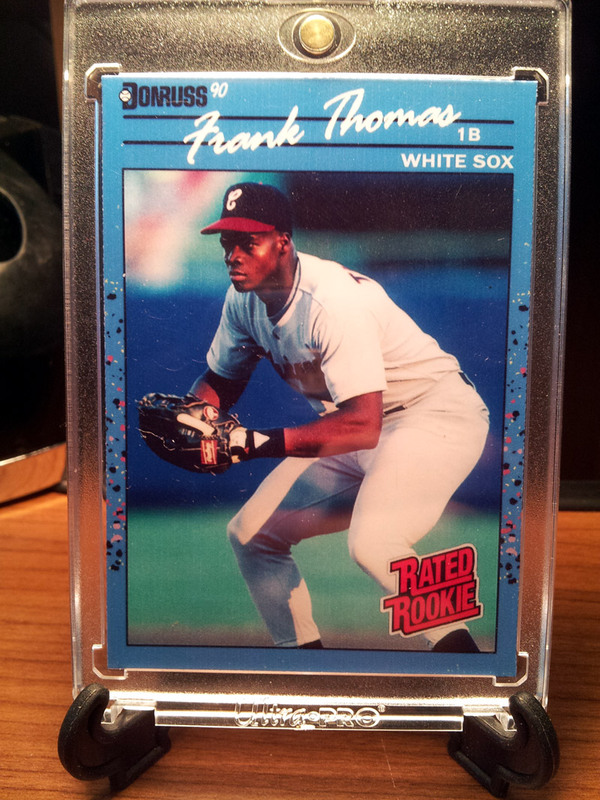 In what could be the most exciting news to come out of baseball cards from the early 90’s, a former Donruss employee has confirmed that there are a very small number of Frank Thomas “rated rookie” baseball cards from the 1990 Donruss “AQUEOUS” set in existence. Known by collectors as the “junk wax” era, the late 80’s and early 90’s were dominated by the “big Five” – Topps, Donruss, Fleer, Score and Upper Deck. “The printing presses literally did not stop from December until June.” commented Jason Sutcliffe, former Donruss Employee. “We told those close to us to never invest in baseball cards, because we knew like any investment, it was all about supply and demand. While the demand was at an all-time high in 1989, we who worked at Donruss knew that the supply was so high, every man woman and child on the planet could own at least 3 sets of 1990 Donruss. Sutcliffe was right. As the internet became more mainstream, the eyes of the public were opened to a better idea of the glut of product out there. Auctions for 100 Sammy Sosa 1990 donruss rookies would pop up, and after a while, you could start picking them up for a quarter per card. The card itself would have a book value of $2.00, but the true value of the card would be significantly less, because everyone who collected already had at least a few, so nobody wanted one. 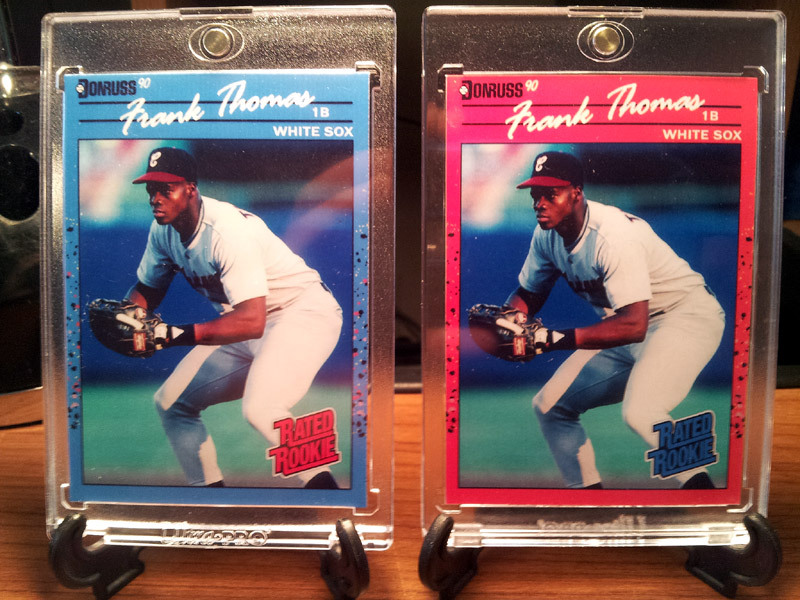 So what makes this 1990 Donruss Frank Thomas so interesting? If Sammy Sosa’s card only goes for a dime, wouldn’t a Frank Thomas from the same set be somewhere within a dollar of that? “It is an ‘Aqueous Test’ version of the card.” Sutcliffe commented. “We were getting many complaints about health hazards due to the ink we were using back in the late 80’s, so as a test, we tried a water based ink. “The ‘throw aways’ were of 3 cards: Gregg Jefferies, Jose Canseco and Frank Thomas. While Jefferies and Canseco made it into the set, Frank Thomas did not. The ’90 Donruss Frank Thomas card that Sutcliffe, and a few other unknown people out there own could end up being the most significant card from the junk wax era, if one ever hits the market. 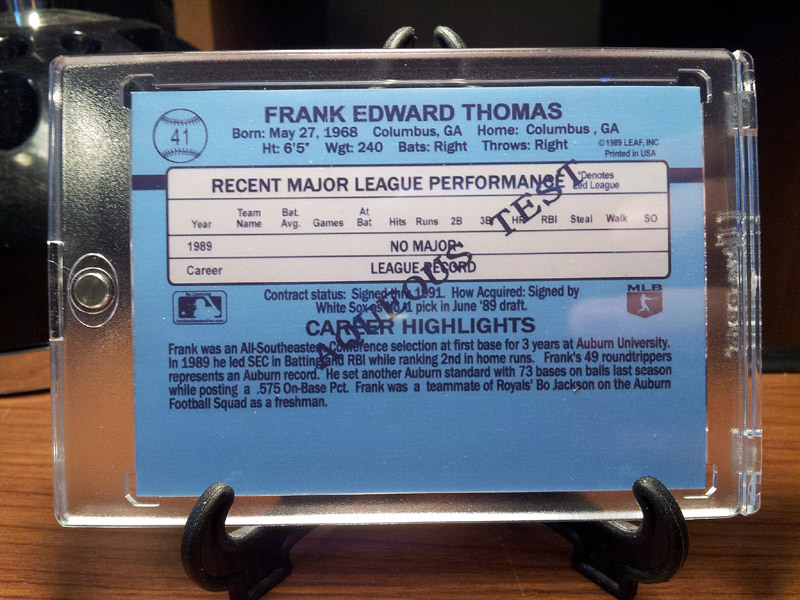 The 1990 Topps Frank Thomas version without his name on the front can easily command over $1,000, and so can some of the stars from the 1990 Donruss Aqueous test set. 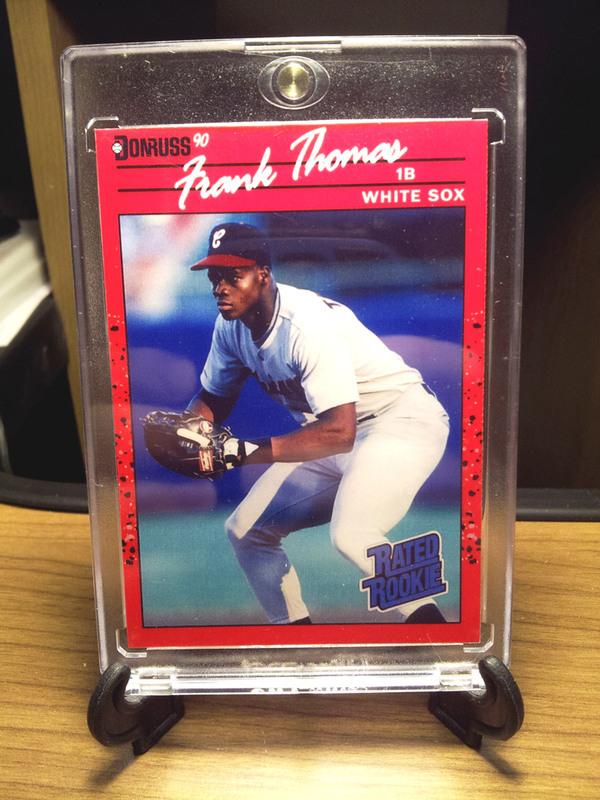 It looks like the crown jewel of Frank Thomas collectors everyone might be out of reach. For now anyway, unless one of the other two owners step forward, or if someone ends up printing them. Joe King is one of the many writers for tanmanbaseballfan.com. King has been a writer for years, and is more of an idea, than a person, just like the others. He has investigated and cracked many fabrications such as the one above. Joe King spends his free time producing high quality, unsubstantiated news articles for his readership to enjoy. Please note, he is never serious. He is Joe King! I’ve really been itching to produce this card in an inverse border/rated rookie logo color variation. I think it turned out super sharp. Here are some pics! Very cool. I always wondered about those Aqueous cards. Thanks for sharing. Always hoped there would be a few gems from the years I collected! Should have posted this on April 1. Did you check out my latest April Fools card release "Four One"?